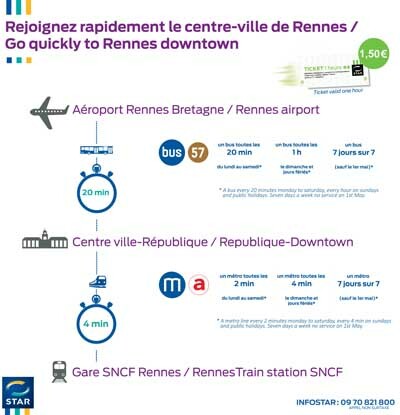 From April 23th, the bus C6 will takes you to the city center of Rennes (Republique station) in 20 minutes, every day. 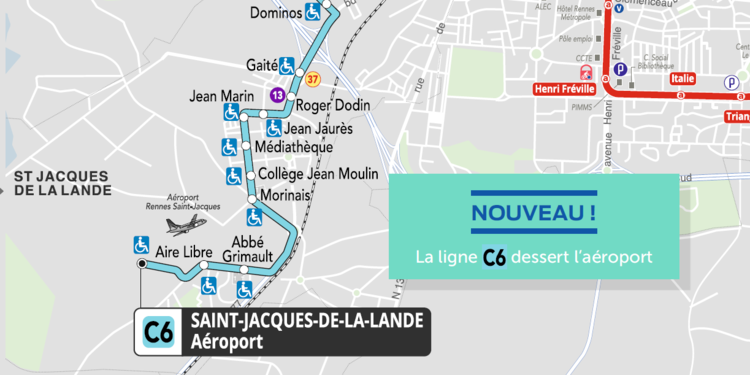 From monday to sunday, the bus stop Aéroport is served. Download the schedules of the bus C6. Otherwise, the bus n°57 takes you to the city center of Rennes (Republique station) in 20 minutes, every day of the week, the week-end and on public holidays. 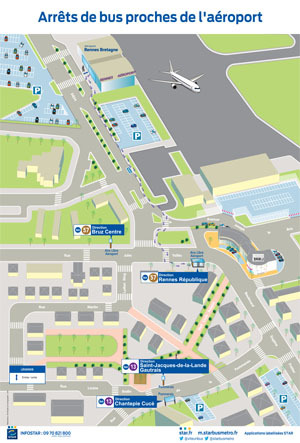 The nearest bus stop is located at the junction between Joseph Le Brix avenue and Jules Vallès avenue, 300m from the terminal building. Buses run every day and on public holidays. 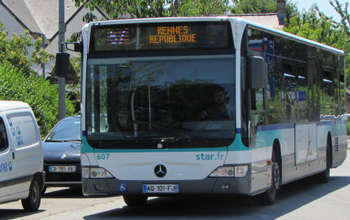 Consult the schedules of the bus n°57 on STAR website. To know the timetable, we invit you to consult the Star website. Frequency: a bus every 20 to 30 minutes during the week. Charges: EUR 1.50 ; tickets are sold individually (valid for one hour). On sale in the bus and at the Information Point of the airport. Rennes Bretagne Airport is easy to reach via the motorway network. You can park on one of the three public car parks at the airport. A drop-off zone is available to drivers in front of the terminal building. Taxis will be waiting for you outside the arrival hall. A TER line connects Rennes station to Saint-Jacques de la Lande in 5 minutes. Five car rental companies operate within the airport. Stay tuned to the latest road traffic conditions. Carpool with passengers of the same flight thanks to Car-Fly! Convenient, economical and friendly! I don’t want to receive informations from Rennes airport. Find all the destinations served by direct or indirect flights starting from Rennes Bretagne Airport.